I don`t know how my parents pulled this off, but from the age of about 4 (so my sister was around 8) we fended for ourselves for breakfast. On weekends they slept in, and and we cooked for ourselves. When we were really young this meant cereal, but as we got older it included pancakes, and sometimes bagels and cream cheese and lox. Either way it was a minute in time when I got to hang out with my sister and feel a little bit grown up. At least until I spilt the milk on the floor and started crying. I always cried over spilt milk. I think because of this I love to make breakfast. I love the quiet of being up first and stretching out across the kitchen. I love the just drinking my tea and making what I want to make. On the odd occasion that Jordan and I have a morning off together, (or more likely when I work in the morning and speed home and he`s still curled up in bed sleeping when I return at 9am) I make breakfast. I like to make it especially if he`s still sleeping and I feel like I have full control over the kitchen. I like the silence of it. So this weekend as I was coming home from work I picked up a few things, made myself some tea , and a frittata and enjoyed the peace and quiet. And then of course I woke up Jordan and we had a perfect lazy Sunday morning. 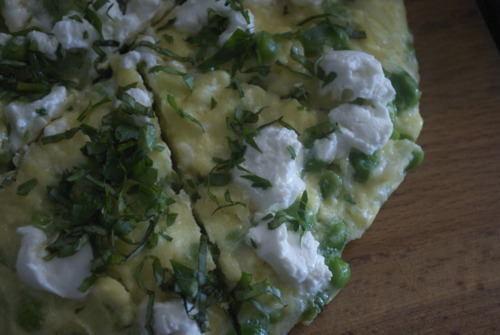 Spring Pea Frittata with Roasted New Potatoes. 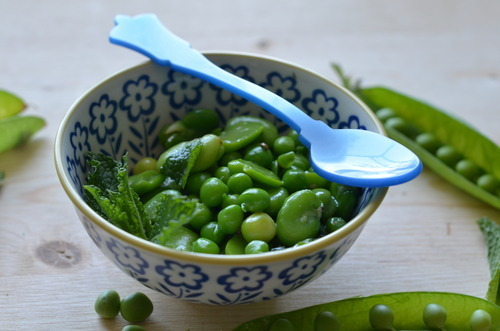 A few leaves of mint, or basil or parsley if you have them! 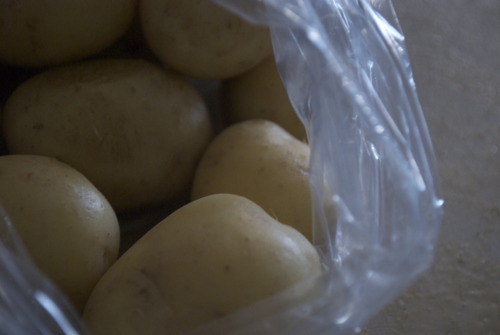 Cut the potatoes into wedges and put in a medium sized pot. 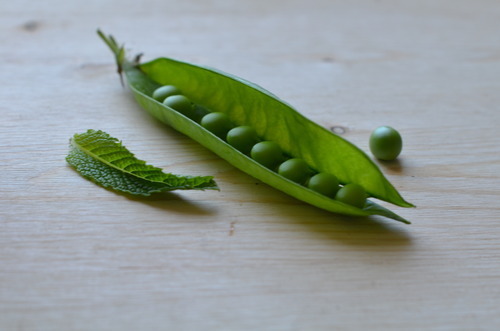 Cover with cold water and bring them to a boil. Cook for 2 more minutes and then strain them. Then in a medium sized frying pan warm the pan on medium heat and pour in your olive oil. When it’s warm add in your par cooked potatoes and let them get nice and brown in there. On medium heat melt the butter in a small frying pan. 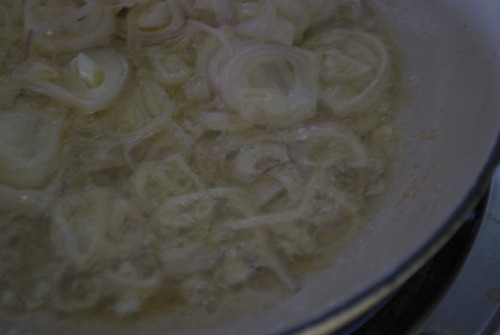 Slice the shallots into thin strips and add them in with a little salt. 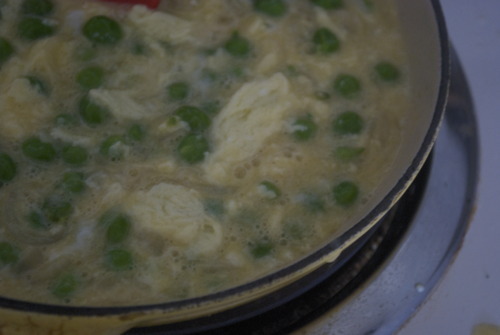 Once they are nice and translucent add in your garlic and simmer until it just starts to become fragrant. 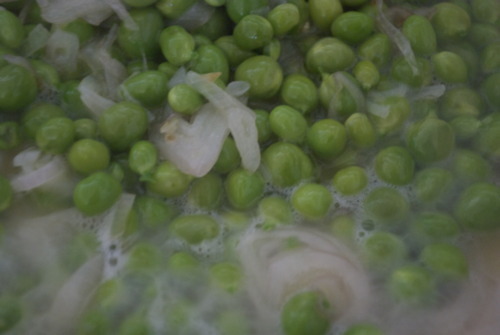 Then add in the peas with a 1/4 cup of water. 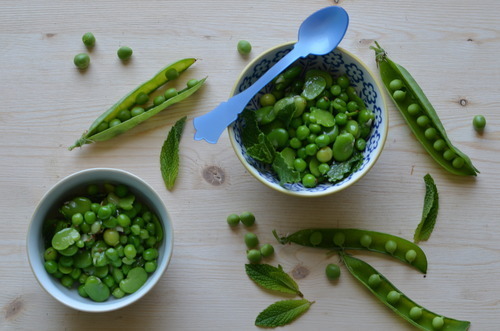 Let the water reduce and the peas get perfectly cooked. 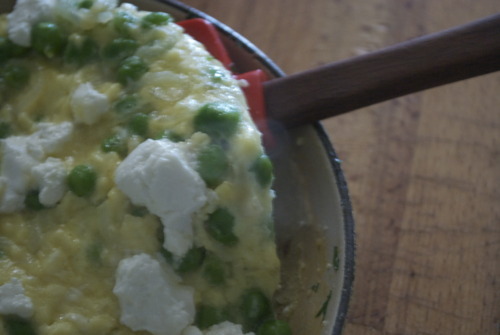 While that’s reducing crack your eggs into a bowl and give them a bit of a whisk. Add in a pinch of salt and a crack of pepper too. Now pour them into the pan. 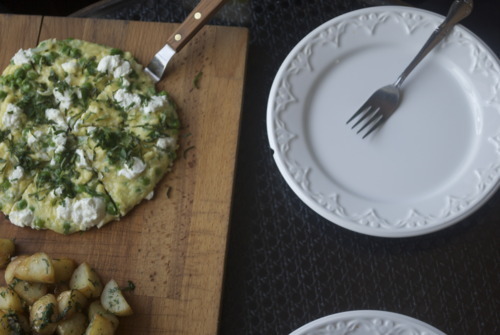 The key to a light and fluffy frittata is that you stir it, scrape up the pieces from the bottom. 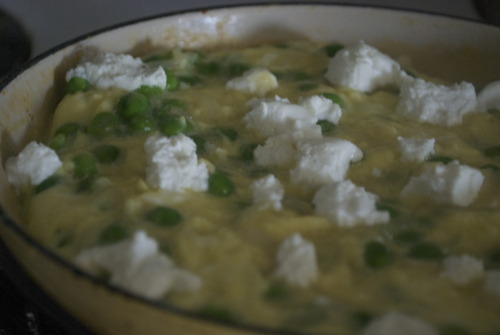 When you have some big pieces and it almost looks like it might be scrambled eggs take it off the heat, smooth out the top with your spatula and crumble your goats cheese on top. Now get it into the oven! Now using a rubber spatula scrape the outsides of the pan and carefully life the frittata out of the pan. 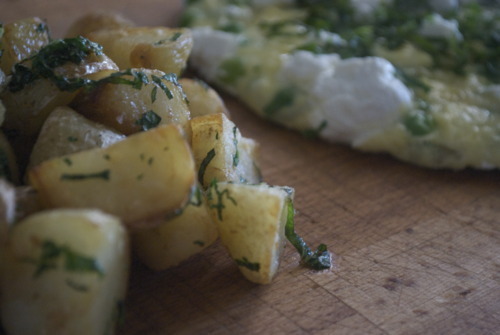 Sprinkle the frittata with any herbs you have around and slide it onto a plate or wooden cutting board along with the potatos.